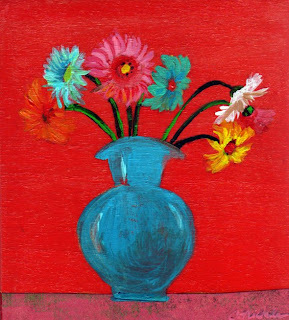 Today's "Happy Monday" $15 print is a new one I completed in my floral bouquet series called "Venice Bouquet" in honor of the beautiful gerber daisies always on sale at the Venice farmer's market. I so miss shopping there on Friday mornings before work. It is for sale as a print at my ETSY shop and the original will soon be for sale on my website today. I've finally finished my collection of small floral paintings, and I just had to take a snapshot of them before they're shipped off to the gallery in California! I love the way they look all lined up in my new Alex drawer set from Ikea. 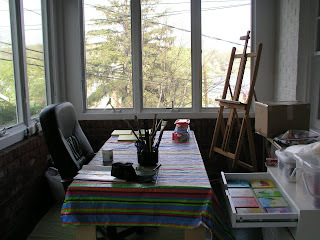 We purchased it this past weekend when outfitting my new sun room studio! 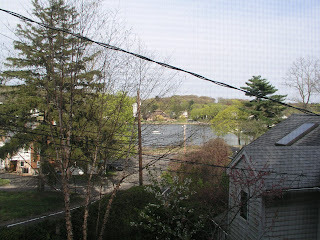 I can actually look out over the harbor as I paint (or sip coffee, or daydream) while my little girl naps. Such bliss after living in Manhattan!! I am in heaven out here. I will be posting more pics of the studio as it evolves (I can't wait to trade out that decrepit picnic blanket for something more neutral). Hope you are having a happy weekend. Happy Monday Prints are BACK! And, by the way, if you're looking for another fun activity this morning, check out Poppy Talk's glimpse inside artists' studios. I'm creating a new studio space on our sun porch, and looking what other artists have done is very inspiring. "Au Printemps" 5x5 inch acrylic & mixed media on wood. I've never actually worked with purple before, so it was fun to experiment with today's 'bouqet.' 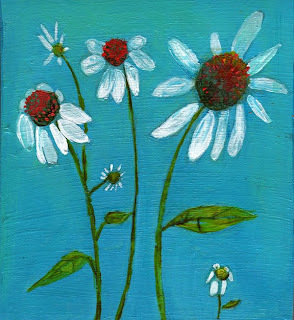 I had the whole day to paint on this sunny Saturday, so I was able to complete a comissioned triptych and this little floral piece as well! Plus, I may get more work than I'd imagined done due to this pregnancy -- it seems like I've expanded to mammoth proportions overnight. At only 7 months along, I can no longer find a comfortable position for lying down. Maybe I'll learn how to sleep standing up!! Well, I hope you enjoy this little lavender confection! 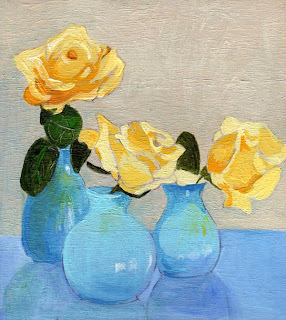 I've been very busy getting some little flower paintings ready for Mother's Day. 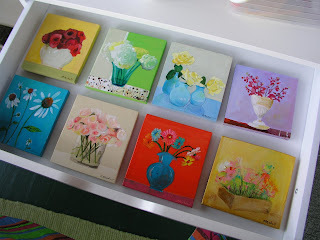 I enjoyed myself tremendously creating these -- flowers are so beautiful and soothing. Just painting them can be a meditation. I hope you enjoy them, too. The originals are for sale on my website & prints will be up tomorrow on ETSY. 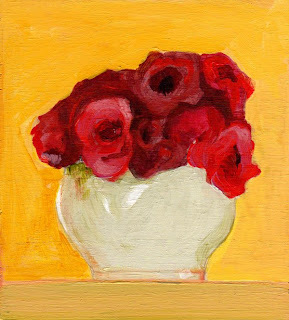 "Yellow Bouquet" 5x5.5 inch acrylic on aspen wood panel (click here to buy original). (click here to buy original). 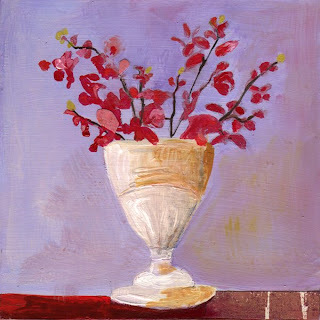 "Red Bouquet" 5x5.5 inch acrylic on aspen wood panel (click here to buy original). As I may have mentioned we had a little mishap with our wood for my upcoming triptych commision the other day... so I've decided to do a fun, creative abstractish diptych with the remaining two blocks of wood. This is today's sketch. There will probably be others. I had actually intended to reverse the order of the pieces, but Photoshop would not comply. Perhaps this is the way they were meant to be displayed. In any case, it was very freeing and fun to create these today! Sometimes you just have to cut loose! 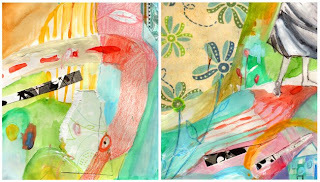 New Triptych - "HELLO SUMMER"
Click the image to purchase prints on ETSY. Well... I was all set to do a commissioned piece yesterday, but we had a little accident with the wood (seems it's time to buy a new saw). So I did this one instead. It was our first sunny day on Long Island since I returned home from brilliantly lit Los Angeles, so I was feeling YELLOW. It's a 3 piece mixed media painting on wood. It was a lot of fun, but I realized that yellow is a lot harder to work with than I'd imagined. I'm not sure if it looks better in this order or with the bicycle in the middle. I'm liking it this way right now. On a less than happy note, I just want to remind all of you parents out there to lock your stairway gates. 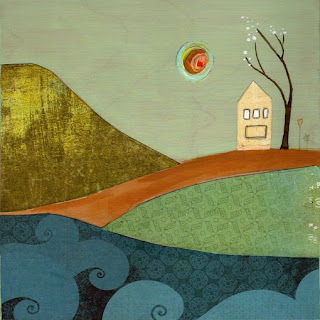 I was home by myself painting, so I didn't lock the gate as my 15-month daughter wasn't home. Then she arrived with Papa and, after helping me put away the groceries, she wandered off to play. A few minutes later, I heard a terrible thumping sound, and I realized, with horror, what had happened. Annabelle had climbed up the stairs and tumbled down several flights of them (only her pacifier on the 6th step held any clue of her actual ascent). My poor baby!!!! We took her to the doctor right away, and she's totally fine. Luckily we just finished having the stairs carpeted. Thank God. I have never been so scared & had nightmares all last night about an ungated, ultra-wide stairway threshold. I am now locking the gate even when I'm home alone (just for practice). Well, I've finally returned from my beautiful vacation in Los Angeles. 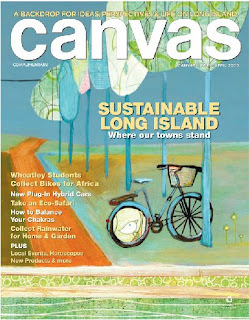 It is a bit dreary here on Long Island in comparison BUT I was happy to find that my painting "Blue Bicycle" was chosen for this month's cover of Canvas magazine. What a nice surprise!! Before I sign off, I want to add a special note of thanks to all of you out there who were kind enough to wish me congratulations on the pending birth of our baby boy!! That was SO sweet of you all! Plus, I had a great time checking out all of your blogs & finding some new favorites to visit! Thank you!